For small spaces up to 150 square feet (1200 cubic feet), the hOme Small Dehumidifier is hard to beat. This unit reduces dust buildup, eliminates mold and other allergens, and reduces unpleasant odors. Although this dehumidifier comes in a compact size, it works incredibly well. This compact dehumidifier with thermoelectric energy does an excellent job at improving indoor air quality. For small spaces, like bathrooms, closets, studies, and even boats and cars with a 110-volt outlet, you can depend on this unit’s performance. For anyone who has an issue with excess moisture, mold, dust mites, and unwanted odors, this compact unit is ideal. Covering up to 150 square feet (1,200 cubic feet), it does an amazing job. This dehumidifier is also perfect for people with upper respiratory problems since it removes allergens from the air. Although the hOme Small Dehumidifier is an excellent choice for any small space with a 110-volt outlet, it has a limited reach. Due to its small design, it cannot offer much help in larger spaces. If you have an area of more than 150 square feet, you would need to consider a more powerful unit. 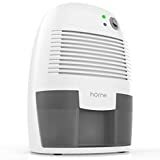 Compact and Lightweight – If you need a high-performance yet affordable dehumidifier for a small room or space, you will not go wrong with the hOme Small Dehumidifier. The unit weighs just 2.6 pounds and measures only 6.5 by 5.3 by 8.5 inches. Extraction Capacity – This compact dehumidifier comes with a 16-ounce (500-millimeter) water tank capable of extracting up to 9 ounces (250 millimeters) of moisture daily. Versatility – Although the hOme Small Dehumidifier is compact in size, it offers a lot of versatility for spaces no larger than 150 square feet (1,200 cubic feet). In addition to a baby’s nursery, bedroom, kitchen, bathroom, and closet, this dehumidifier is perfect for vehicles with a 110-volt outlet. For instance, after a weekend boating trip, you can use this unit to remove excess moisture, thus preventing the growth of mold and musty smells. Quiet and Energy Efficient – Thanks to the Peltier technology with thermoelectric cooling, this dehumidifier operates quietly. While the unit uses little electricity as is, the energy efficient design reduces consumption even more. That means you can use this dehumidifier continuously for 24 hours and never worry about your electricity bill. 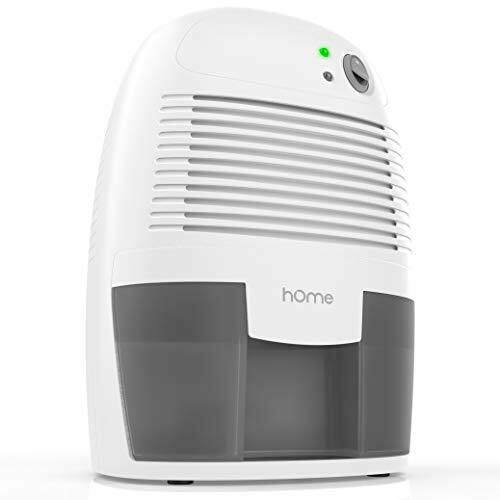 Safety – The hOme Small Dehumidifier has two unique safety features. First, it comes with a 25-watt ETL certified adapter that prevents overheating during operation. Second, it has an automatic shutoff feature. Once the tank fills, the LED indicator light informs you, and the unit turns off automatically. Because of that, you can leave it running without having any concern. Coverage – For any space of 150 square feet (1,200 cubic feet) or less, this dehumidifier performs optimally. Not only is it an excellent choice for homes and businesses, but it also works incredibly well in cars, boats, RVs, travel trailers, and other small spaces with a 110-volt power capability. Optimal Operating Conditions – For peak performance, it is essential to use the hOme Small Dehumidifier under the correct operating conditions. These include running the machine between 59 and 104 degrees Fahrenheit (15 to 40 degrees Celsius) and relative humidity between 40 to 80 percent. Using the hOme Small Dehumidifier requires nothing more than plugging the 25-watt ETL certified adapter into a 110-volt, 2-flat pin outlet. After turning the unit on, you can allow it to run continuously for 24 hours or as long as wanted. At that point, the LED indicator light comes on, and the dehumidifier turns off automatically. Dump the tank and replace it for future use. If you have a room at home or work, or you need to eliminate excess moisture from a car, boat, RV, and some other vehicle with a 110-volt outlet, the hOme Small Dehumidifier is a fantastic choice. However, if you need something slightly larger yet affordable and portable, you can always opt for the iSiLER Portable Dehumidifier with a 4.2-pint (2-liter) water tank. This dehumidifier covers up to 269 square feet (2,200 cubic feet), which is perfect for bedrooms, kitchens, bathrooms, basements, and so on. For optimal safety, it also boasts an automatic shutoff once the tank fills and ultra-quiet operation. The hOme Small Dehumidifier improves indoor air quality by removing mold, mildew, dust, and also eliminates unpleasant odors. It also features an extremely quiet operation, plus it has an automatic LED light indicator and shutoff once the tank fills.